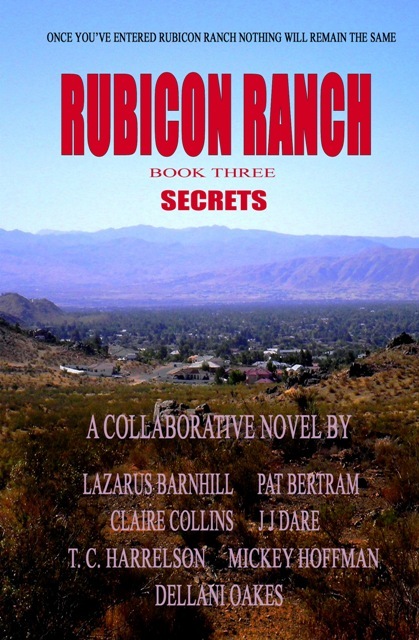 Rubicon Ranch is a collaborative and innovative crime series set in the fictional desert community of Rubicon Ranch and is being written online by the authors of Second Wind Publishing. In the current story, the body of a local realtor is found beneath the wheels of an inflatable figure of a Santa on a motorcycle. The realtor took great delight in ferreting out secrets, and everyone in this upscale housing development is hiding something. Could she have discovered a secret someone would kill to protect? There will be suspects galore, including a psychic, a con man, a woman trying to set up an online call-girl service, and the philandering sheriff himself. Not only is the victim someone he had an affair with, but he will also have to contend with an ex-wife who has moved back in with him and a jilted lover, both with their own reasons for wanting the realtor dead. We hope you will enjoy seeing the story develop as we write it. Let the mystery begin! Whodunit? No one knows, not even the writers, and we won’t know until the very end! If you don’t want to miss further chapters, please go to the blog and click on “sign me up” on the right sidebar to get notifications of new chapters. She didn’t really expect to discover his secrets this easily, but she hoped that she could at least find a place to start looking for answers. The immediate responses were condolences from those who hadn’t known about his death and from those who hadn’t taken the time to write five months ago when he’d died in what had seemed to be a car accident. A few responses included an anecdote about Alexander, but no one dropped a hint about what he could have done to trigger an assassination. Only one response surprised her. She’d expected their agent to gush with delight at the prospect of the book, but Dottie wrote: Are you sure this is a wise idea, darling? You might not like what you find out. And isn’t it better to remember him as a real man rather than a character in a book, even one as brilliant as I’m sure yours would be? Too tired to think of a response to her agent’s message, Melanie dragged herself to bed. She dozed off but jerked herself awake to escape the shadowy creatures who chased her into a building with no windows and no way out. She thought she’d been asleep for only a few minutes, but the brightness of the room told her she’d slept far into the new morning. She lay in bed, unwilling to face another day in the horror that Rubicon Ranch had become, when she realized she heard something strange for this neighborhood—silence. She jumped out of bed, ran upstairs to her loft office, and glanced out the window. No tour buses, no streams of cars with gawking passengers, no young people (or old people for that matter) dressed as Halloween ghouls. The only things out of the ordinary were the sheriff’s department vehicles cruising the street—at least four of them. One of the tan vehicles pulled up to the curb in front of her rented house, and Sheriff Seth Bryan climbed out. Melanie dashed down the stairs to the bathroom, splashed water on her face, ran a brush through her hair, and grabbed a dress from the closet. The off-shoulder peasant dress wouldn’t have been her choice for the first encounter with the sheriff in two months, but she didn’t have time to rummage in her closet for something more appropriate. The doorbell rang. Barefoot, she went to answer it. The sheriff’s jeans and white shirt still fit his lean, flat-bellied body as if they’d been tailored for him. As when they first met, he wore a blue ball cap with “Sheriff” embroidered in yellow, but his hair curled around the cap as if it had been awhile since he’d taken the time to get it cut. For once he’d left off the mirrored sunglasses, and he looked as if he’d aged two years since she’d seen him last. Apparently, his attempt to make his marriage work hadn’t succeeded. Or maybe the marriage was succeeding, and his haggard expression and weary dark eyes came from too much time in bed with his wife. “Good morning, Ms. Gray,” Sheriff Bryan said, his tone as formal as his words. The sheriff quirked one eyebrow as if surprised to discover she had a sense of humor, but Melanie had to admit to herself that in their relationship—if a few meetings and a couple of meals could be called a relationship—there’d been no room for humor. There’d been too much death, too much pressure, too many unanswered questions. “Have you found out anything more about Alexander’s assassination?” Melanie asked. Melanie gazed at the driveway where the car had been parked that morning. She’d put the cameras in the trunk. Alexander had yelled at her from inside the house that she had a phone call. She’d slammed the trunk shut and hurried inside. The call had been from Dottie, their agent, wanting to know if they’d get the book done by the deadline. Melanie had been annoyed with Alexander for not talking to their agent himself because it would have taken him less time to assure Dottie than to shout for Melanie. When she hung up the phone and went outside, she found that Alexander had left. She never saw him again, never got to say good-bye. The sheriff’s voice, smooth as melted chocolate, startled her. “Stop calling me that,” she snapped. “What would you like me to call you?” he asked. Melanie clamped her mouth shut, refusing to rise to the bait. Melanie glanced back at the door of the house, wondering if she could slip inside for shoes to warm her icy feet, but she didn’t want to have to invite the sheriff into the house. It would feel too much like a fly inviting a spider to visit. Melanie ran inside, put on socks and shoes, and then sedately ambled back outside. The sheriff hadn’t moved. Melanie narrowed her eyes, wondering if that had been a dig, but he continued as if unaware of her reaction. Melanie tried to remain as still as the sheriff. Or was that the wrong way to act? Did her stillness indicate guilt? Crap, being a maybe murderer was hard. “I met her once, but we only exchanged a few words.” I know you killed your husband. “Ya think?” the sheriff interjected. When Seth cut across her property to the Sinclair house, Melanie realized he hadn’t asked her about the arson. He didn’t forget such matters. Like Moody, he had his own agenda, kept his own counsel. You never know when to leave well enough alone, do you? Alexander Gray is dead. Let him rest in peace.